Product #2321 | SKU BEPS400 | 0.0 (no ratings yet) Thanks for your rating! The PS400 features XLR THRU jacks and provides superb noise-free operation. Just connect your condenser mic to the MIC INPUT and send a line from the MIC THRU to your mixer. 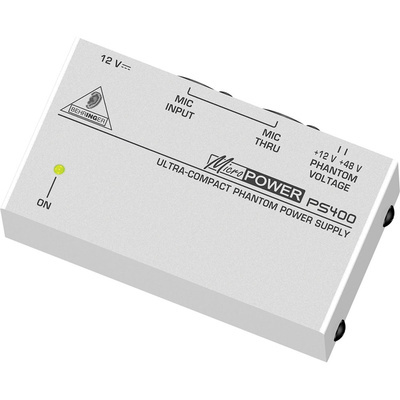 You can toggle between +12 V and +48 V power for maximum flexibility. This handy audio solution comes with a 12 V DC power supply and an LED to indicate when it is powered up.